The May 2016 State of Oregon Economic Indexes of was released today. Full report is available here. We thank KeyBank for their generous support of this project. 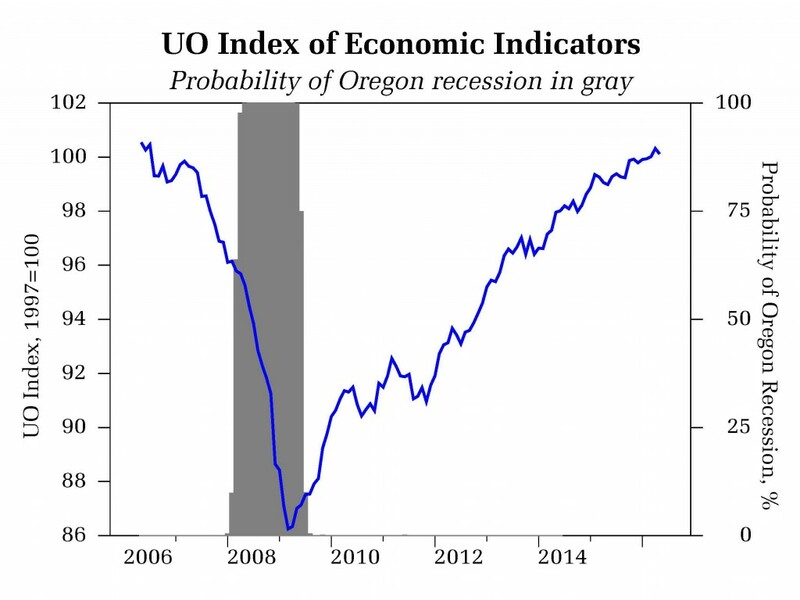 The Oregon measure of economic activity slipped to 0.62, down from an upwardly revised April figure The three-month moving average, which smooths month-to-month volatility in the measure was 0.77, where “zero” indicates average growth over the 1990-present period. In a reversal from last month, the manufacturing made a positive contribution to the measure on the back of a rebound in average weekly hours worked within the sector. The construction sector impact was effectively neutral; housing starts remain low compared to the experience of prior expansions. The slow pace of construction is a supportive factor for housing prices. The household sector made the largest contribution to the index, with low levels of initial unemployment claims, low unemployment, and solid consumer confidence all significantly contributing positively to the sector. The services sector was marginally supportive to the overall measure of activity. 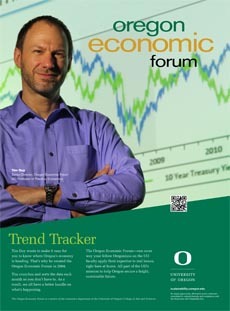 The University of Oregon Index of Economic Indicators slipped 0.2% in May. Initial unemployment claims rose but remain in a range consistent with steady employment growth. Employment services payrolls (largely temporary help workers) fell back to December 2015 levels; national numbers have been soft in recent months as well, possibly reflecting the slowdown in manufacturing. Residential building permits, the weight distance tax, and consumer sentiment all edged higher while hours worked in manufacturing jumped. Core manufacturing orders continued to trend down; the sector remains under pressure from a strong dollar and weak energy prices.